Nothing is more interesting then watching our favorite celebrities lose weight. This seasons cast promises to be the most dramatic yet! Here is the cast for this season’s “Celebrity Fit Club” … straight from my favorite gossip site www.laragmag.com. “Since we can’t escape the world of reality television, we get to know most of the casts before they hit the trades. Our source came to us with all the celebrities that will be tackling their weight issues on Celebrity Fit Club ( whatever season this is). 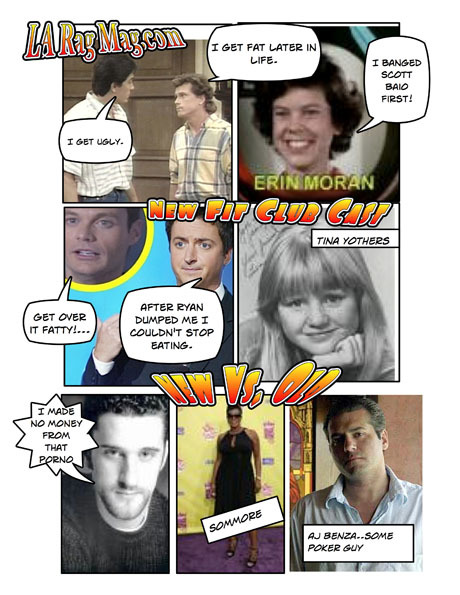 It’s the NEW Vs. the OLD and we’re told an unwanted Dustin Diamond is back to wreck havoc on anyone who’s there to try and lose some actual weight! Brian Dunkleman joins the cast too and sources say he was a total alcoholic on the set, but we’re wondering if they’re going to put that in the edit. What are we saying? Of course they will! If you love drama and weight loss, then you’re in for a treat! If you like biggest loser you will love to watch as the celebrities take a new twist on losing body-fat. Maybe YOUR favorite star will help to motivate you off your couch and into the gym! my girl friends and i would get together and watch celebrity fit club while working in my home gym. there is 16 of us and when we watched last seasons fit club. watching dustin diamond made us sick. he had a smug look on his face and pulled everyone down emotionally and basically spit in everyones face. what the hell was he doing there in the first place? he caused problems and was dragging everyone else down with him. he is nobody!!!! he is the anti christ and if the producers think they will have a ton of people watching, think again. why did you have to crawl down into a barrel full of s..t and pull that person who thinks he is human out? my girlfriends and i will no longer watch this show just because of the filth (dustin diamond) you put on that show! i have to cut this short because i feel like i am about to puke.... good ridence, a former fan p.s. harvey, i love you and you look yummy enough to eat!!!! !